In addition to our Sponsorship and Partnership opportunities, special underwriting opportunities are also available which allow your organization to underwrite specific elements of our largest fundraising event, Night of a Thousand Gowns. This event, attended by hundreds of individuals from all across the United States, Canada, and Mexico, is considered the social event of the season and the crown of the International Court System. Special underwriting opportunities are available and carry added recognition for those who support specific elements of the ball – for the set and table décor, for the silent auction, for underwriting the program, etc. Download our Sponsorship brochure which describes our mission, sponsorship opportunities, and underwriting opportunities. 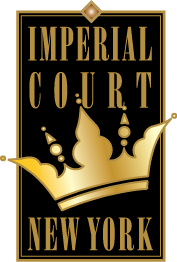 Do you represent a company that would benefit by sponsoring The Imperial Court of New York? Contact us at sponsorship@icny.org for information.